30+ North Carolina Dental Plans available. You’ll save between 10% – 60% on expensive dental care such as braces, dentures, crowns and much more. Simply enter your zip code into the box above or call us Toll Free Today! North Carolina dental plans are an excellent choice for individuals living within the state of North Carolina. In most cases dental plans are much more beneficial than dental insurance plans, both for your wallet and for your teeth. As with all types of insurance, dental insurance typically requires a premium payment each month, typically running from $30 a month for individuals to as much as $100 a month for families. This can really add up over the course of the year. However dental plans have a starting cost at about $80 a year and about $130 a year for families. This offers substantial savings. The payments after going to the dentist also vary. 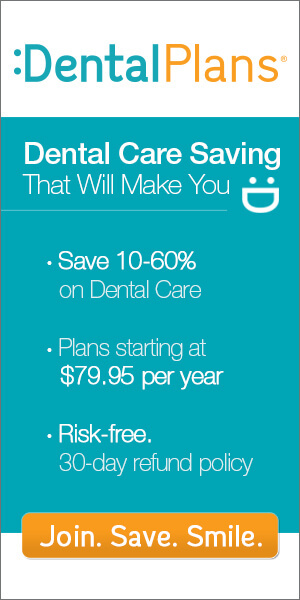 Those with dental plans are offered discount rates, no matter the type of service. However with dental insurance the deductible is paid and then the insurer pays the rest of the cost. Depending on the type of dental work being done this may or may not work out well. Additionally dental insurance typically has a cap on how much can be reimbursed each year. If this number is exceeded then the individual will have to cover all costs. However dental plans offer the discounted rate no matter how many times you need to visit the dentist. Dental plans are also typically less time consuming than dental insurance. As with any insurance the claims process can be quite tedious, requiring many forms to be filled out and mailed in. North Carolina dental plans provide a membership card to the holders and this is presented whenever they go to the dentists and all discounts are immediately applied to the bill. No additional paperwork needs to be filled out. Another advantage to dental plans is that all procedures will be covered and activation of the plan benefits is very fast, normally within three days. This is very fast compared to dental insurance in which it can take a long time for coverage to be approved and many procedures are excluded from the policy. For those that want healthy teeth and no hassle, North Carolina dental plans have many more advantages than dental insurance. Call us today to see what plans are in your area at 1-855-214-7725 or enter your zip code above.